A new weekly social club providing a range of activities and support for carers at Paddock Village Hall is to be launched in June 2015 and will run for twelve months. Carer’s break funding has been secured by Paddock Community Trust to offer carer’s and isolated people an opportunity to take part in a programme of weekly activities such as arts workshops, computer training, fitness classes and gardening. Project partners, including Carer’s Count and Cloverleaf Advocacy, will also provide regular advice, information and advocacy support. The funding was awarded by Kirklees Council Community Partnerships. 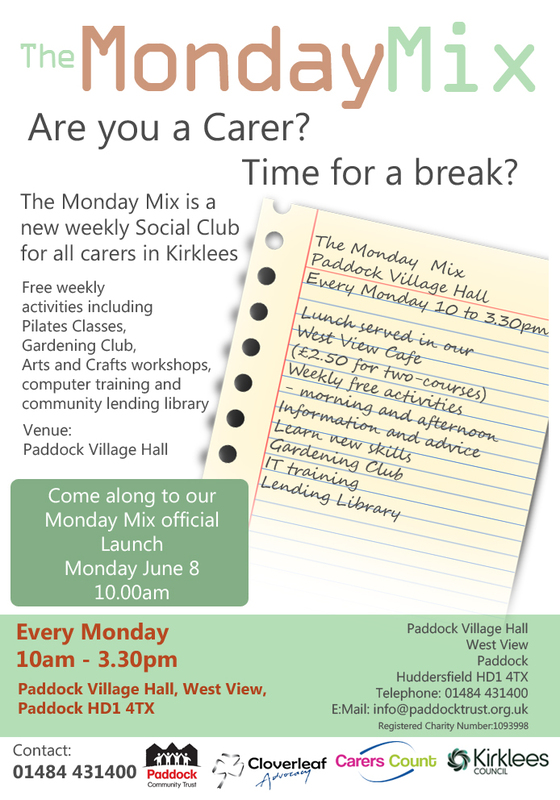 The activities will take place every Monday from June 1st and will include a two-course lunch served in the Trust’s community café at Paddock Village Hall.